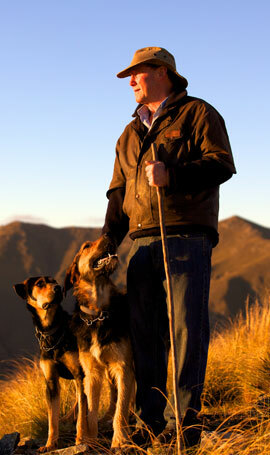 Lloyd Smith is one of New Zealand's best-known and consistent sheep dog triallists. He is also a proven and highly respected sheep dog trainer, who has developed a training method that many shepherds and farmers now use and get excellent results from. "My association with working dogs goes back to 1969 when I left South Otago High School. My first job was with Bill Walker on Hazeldale, up the Clinton Gorge. I had intended to go on to Lincoln College and had attended a couple of pre-entry courses but along the way I found that I enjoyed stock work and had gathered up a team of dogs - a motley-looking bunch, but a team nonetheless. I left the Clinton Gorge and went to muster on Nokomai Station, first under head shepherd Bob McKay, then Larry Murdoch. It was through working in the hill country with them, and many other top stockmen such as Ted Phipps and Sam Boynton, that I learnt the principles of good stockmanship and how to train a dog according to those beliefs. In the early years I trained my dogs solely on stock. More recently I've modified my system and do a lot of the basic training away from sheep, so it's only the dog and me. This way I can get the dog to take command without being distracted by sheep: with just the two of us it becomes a straightforward obedience issue. My first priority is to train good dogs for basic farm work. Dog trialing is a natural progression if the trainer so chooses and the dog shows they have the ability and temperament required. I started attending New Zealand and North and South Island sheep dog trial championships in 1982 and have been placed 47 times, including winning five New Zealand titles and five South and North Island titles. I have also been selected twice for the New Zealand Test Team competing against Australia. All these results have been gained with dogs that I have trained myself. Maintaining discipline by insisting on good manners. Stage-by-stage progression through to a fully broken-in working dog."